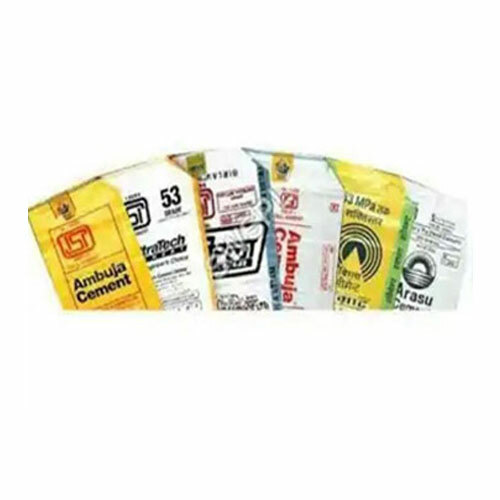 We are counted among the leading manufacturers and suppliers of a wide array of Polypropylene Cement Bags. Our products are precisely observed by our professionals in adherence with the industry. Further to meet client's satisfaction we are offering these products in various designs. These products are acclaimed for their durability. The material used for these carry and storage bags protect the packaged products from varied factors like rain, extreme weather and others that could hamper the quality of the item it is containing. We offer innovative and cost-effective packaging concept with light weight cement bags. These laminated polypropylene bags have special linings that result in better resistant to humid conditions, in turn, leading to prolonged shelf life of the packed products. Heat Cut, Zig Zag, Hemming. MFG. : PP/HDPE WOVEN SACKS BAG & FABRIC, BOPP BAG & FABRIC.